If you enjoy French beading, then it occurred to me that it would be really useful to have a single place where you can get links to loads of French Beaded flower tutorials. So I’m starting that list here. I will be adding to the list regularly, so you are going to want to keep checking back to find out what is new. The easiest way to do that is to bookmark this page…and I have good news – that could not be easier! Just press ctrl+D on your computer keyboard right now and you’ve done it! Well, without further ado, time to get on to the list of French beaded flower tutorials. I have included a brief sentence or two about each tutorial so you will find out something about the techniques and level of experience. Then just click the link to go straight to the place where you can download that tutorial. If you are just starting out, then the bonsai tree is a great option. It uses just the most basic loop technique. The skill is only in your artistic ability in arranging your branches! For another basic option, the mix of simple flowers and clover in the arrangement above, is a really easy way to create a stunning arrangement. Get the French beaded flower tutorial here. The little potted cactus uses more advanced techniques, so this is a more ambitious project. You can find it here. The calla lily is a beautiful flower, but again you will be using slightly more advanced techniques. Pot plants are a great way to decorate your house, or give as gifts to friends. The best thing about French beaded pot plants is that you can’t kill them! The orchid French beaded flower tutorial is available here. Cherry blossom branches make a great display in their own right, or you can use them as foliage with other flowers. The cherry blossom tutorial uses very basic techniques, so is great for any level. The fuchsia also makes great foliage or a stunning display. This project uses a mix of techniques, but none of them are difficult. Find the tutorial here. The snowdrop pattern is quick and easy to make and it looks great with other Spring flowers, or on its own. Aquilegia is a gorgeous flower and this tutorial uses a couple of basic techniques, so it’s great for any level. The daffodil uses basic techniques, so you can easily make this flower. It looks stunning in a display with iris. The iris tutorial also uses just the basic technique and simple bead stringing, so it’s perfect whatever your level. If you like the pot plant idea, then this cyclamen is a real winner. It uses more advanced techniques. For another simple flower that is great at beginner level, this oxeye daisy tutorial is ideal. You will be using basic loop techniques and also getting a gentle introduction to the basic technique. The poppy uses a different variation of the basic technique, but it is a very straightforward pattern, so suitable for any level. To keep to the summer flower theme, the sunflower uses a mix of techniques, but nothing too advanced. The tulip uses the basic technique and will mix well with the other Spring flowers, or as you can see in the photo, it makes a great pot plant in its own right. Miniature roses are ideal for creating corsages or ornamentation. The tutorial uses the basic French beading technique. For another simple option that is great as a complement to flowers, like the poppy, this wheat pattern is ideal. It uses just simple loop techniques, so is perfect for any level. For another cactus, how about this prickly pear? Again, this uses slightly more advanced techniques. 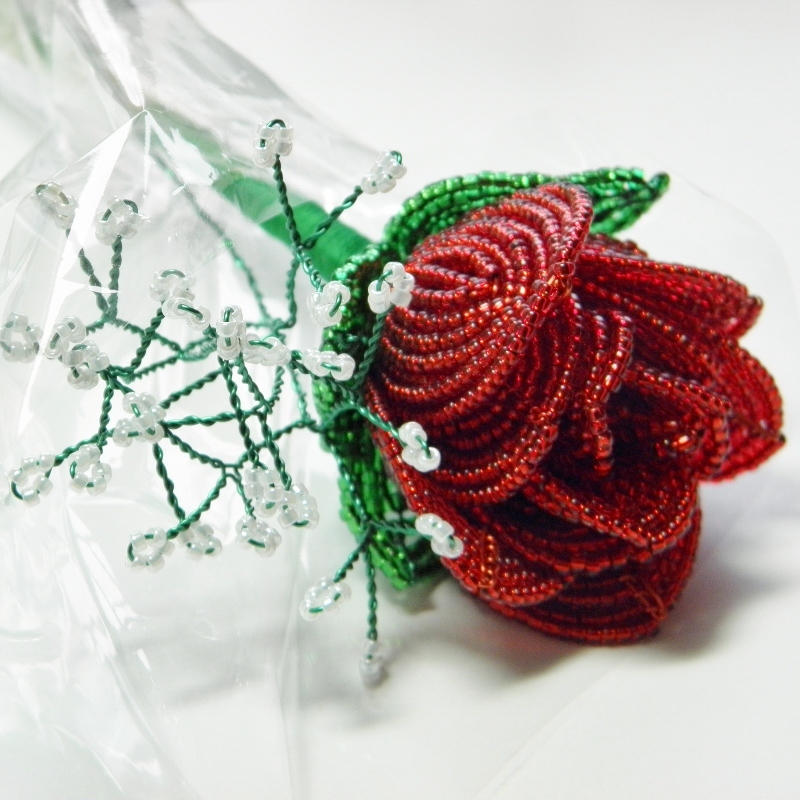 For an easier project, this corsage is made with semi-precious stones and seed beads. It appeared on Jewellery Maker TV in 2016. If you want more French beaded flower tutorials in one place, then it is a great idea to try a book. There are loads of brilliant French beading books on the market, so here are some links to places where you can buy just a few of them. If you want the benefit of learning via video, then these two ebooks will really deliver. You can print them out to use like a real book, but in addition to the usual instructions and photos, these books have video tutorials embedded, so you really get the best tuition. Bead Flowers and Wedding Bouquets includes tutorials for roses, lilies, orchids, fern ivy, gerberas, stephanotis, gypsophila and star flowers. You can Flower Forever‘ is a simply amazing book. Don’t forget, I will be updating this post with more French Beaded Flower Tutorials and book recommendations, so bookmark the page (ctrl+D) and then you can keep checking back for more ideas. If you’ve found this helpful, please share it with your friends – thank you! Hi is anywhere I can find a holly leaf pattern?